Pictor A: The brightest radio galaxy in the Constellation Pictor. Caption: Chandra's image of Pictor A gave scientists their first look at a spectacular X-ray jet. 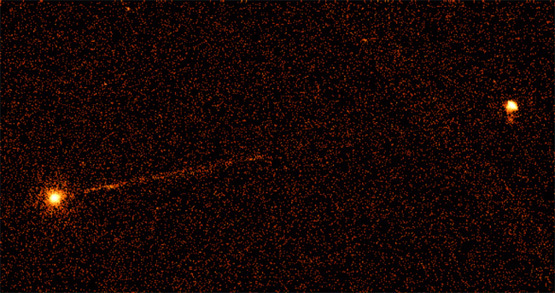 The jet originates near a giant black hole (left) in the central region of the galaxy and streaks toward a brilliant X-ray hot spot (right) 800 thousand light years (8 times the diameter of our Milky Way galaxy) away. The hot spot is thought to represent the advancing head of the jet which brightens as it plows into the tenuous gas of intergalactic space. Scale: The hot spot is 4.2 arcmin from the galaxy.